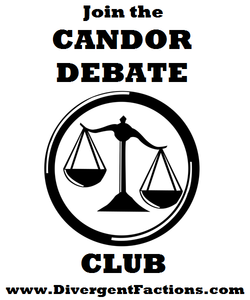 The rules of the Candor Debate Club are simple, so please follow them. Rule 1: No insults. If you insult another member of Candor, your comment can be deleted and you may be kicked out of the club. We do not want to do this, so please play nice! Rule 3: Tell the truth. Always be sure that you have researched your claims and the information you provide is truthful. As Candor is the only honest faction, it is especially important that you follow rule #3 and keep all debate in factual data. If you would like to join in on some healthy debate, please go "Like" our Candor Facebook page! Debate topics will be posted on a regular basis and you can participate as often as you want. The fun hasn't started yet! Join our Facebook page to offer suggestions on what you think our first lively debate should be about!